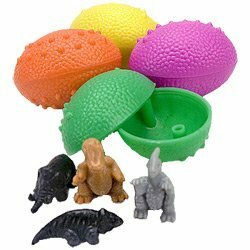 Each 2″ bumpy-shelled dinosaur egg comes with a little 1 1/2″ dinosaur inside. There’s 14 different ones in all and each egg has a small collector’s sheet. Unfortunately, we can’t tell what is inside each egg – that’s for you to find out when you open them up!